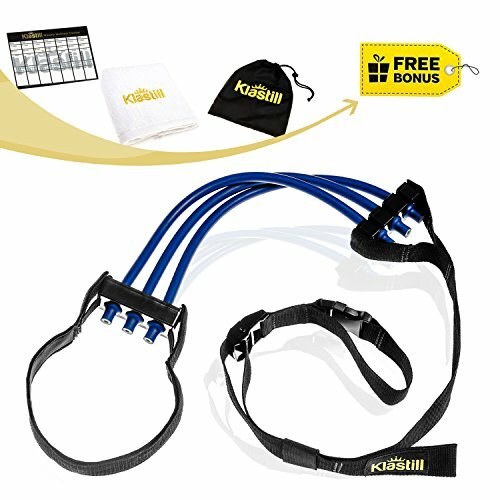 KLASTILL gives you the most exclusive Pull up Assist Band if you truly want to improve your technique while pushing through muscle fatigue like a pro! Designed by professional trainers with great attention to details & passion for fitness – It’s the most innovative way to get the necessary assistance to achieve your upper body strength potential! Why choose our Klastill Resistance Chin up Band? Define new limits for yourself > get always the necessary push to complete the last few reps and increase your performance! Make it fit your unique style > the band is fully adjustable to your weight and goals – perfect for women & men with an innovative design! 5-Year Warranty > made of only EXTRA-DURABLE materials to avoid serious injuries – we we’ll never let you down! 100% Stability & Correct Form > our unique EasyClasp System insures that the band will never unclip and will hold you in a complete straight position! Your progress matters to us > it helps beginners push through their first reps and advanced people when their muscles are giving up! BONUS – Microfiber Fitness Towel + Weekly Tracker > take notes of your progress and always push yourself – We believe in you! Let’s Work out together & Achieve our potential! Add the Resistance Assist Band to cart and start a new fitness exprience!  WHILE OTHER PULL UP ASSIST BANDS rip after a few uses, unclasp during the exercise or just simply offer no assistance whatsoever, our Exclusive Assist Band is made of ONLY PREMIUM & ECO-FRIENDLY materials which guarantee at least 5-Year Lifetime and the Unique EasyClasp System is 100% SECURE during pull ups protecting you from injuries. The extra-stretchable rubber gives you the right push depending on your weight. - REVOLUTIONARY & FAST RESULTS!  OUR MISSION IS TO MAKE EVERYDAY LIFE HEALTHIER & HAPPIER - We are real people who use our own products daily. We expect the best for our family and want the same for yours. Our assistance bands are perfect for BEGINNERS who struggle to do chin ups, offering always the essential help and for the more advanced ones, it will add reps after the muscles fatigue. The non-slip foot stirrup provides full stability. - TRAIN LIKE YOU ARE ON A MISSION!  A PERFECT BIRTHDAY GIFT! If you are looking for a great gift for you or a loved one that has that "innovative and extra-cool" wow factor, then you will love our Exclusive Pull up Assist Band. The eco-friendly stretchable rubbers ADJUST the tension accordingly to your weight. The bundle comes in a CUTE carrying gift bag and includes a FREE Microfiber Gym Towel + 1 Weekly Tracker Schedule by Klastill. - KINDNESS IS CONTAGIOUS!  ONLY THE BEST FOR YOU...We pride ourselves on providing top quality products and amazing United States based customer service. We created our Premium Pull Up Assist Band with continuous research and attention-to-detail to provide the most rewarding gym experience during your daily workouts. You can ADD your Resistance Band to your cart with total peace of mind, knowing that if you aren't 110% HAPPY with your purchase, we'll provide you a FULL refund. If you have any questions about this product by KLASTILL, contact us by completing and submitting the form below. If you are looking for a specif part number, please include it with your message.